In my current pursuit of all knowledgeable Jewish reflections on Hinduism, I went searching for contact information for Rabbi Dr. Alan Unterman who years ago had written on the interface of the two faiths. In the process, I came into contact with his daughter the fascinating author Yael Unterman. Most of my readers know her from her award finalist book, the over 600 page labor of love Nehama Leibowitz: Teacher and Bible Scholar. 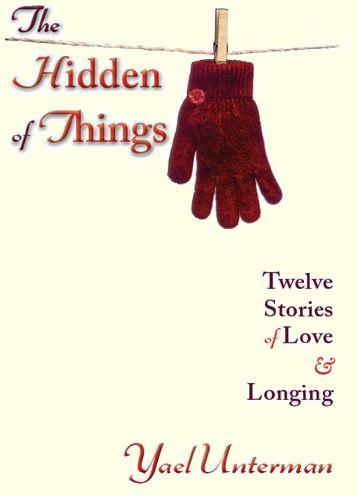 Moving from non-fiction to fiction, Unterman has a recently published book of short stories about Orthodox singles life The Hidden of Things: Twelve Stories of Love & Longing. The first eight questions of the interview are on her new book and in the last few questions I made her return to her earlier book on Nehama Leibowitz. 1)	Why is your book called The Hidden of Things? I am quite obsessed with what is hidden and what is revealed in our lives. This is true for the interpersonal level, in terms of interactions and dress, and for the media, in terms of revealing of secrets and lack of boundaries. Today’s cultural climate does not reward modesty and reticence, with all the talk shows and candid memoirs and therapeutic language that pervade the air; but on the other hand, the professed values of traditional Jewish society can fall too far along the other extreme, leaving too much unsaid, sometimes to terrible effect. I am prone to chronically wondering to what extent God is revealed to us today, is there ongoing revelation in every moment, and if so how can we make ourselves sensitive to receiving the divine, or is it all concealed within the tzimtzum through which we were created? The act of writing a book reveals things ordinarily hidden from view – the nuances of characters’ private feelings and motivations. Writing such as this can resonate with the hidden inner parts of the readers, who might have previously believed themselves completely alone in certain thoughts or feelings that you, the author, have now articulated – and that’s liberating. 2) Why do you call yourself “unorthodox orthodox”? It implies that freethinking and individualism is allowed, even within Orthodoxy. Generally the label “modern orthodox” does not seem to sufficiently cover who I am, so I like to add something to it to spice it up – calling myself, for example, “Neo-Hasidic postmodern Orthodox” or “Paradox” (the latter slightly tongue-in-cheek!). People seem to need labels, which can be helpful when trying to ascertain the existence of common assumptions; and the fact remains that I have held onto the label “Orthodox”, while some friends of mine have jettisoned it altogether. Nevertheless such brandings also divide, constrain and mislead. I live in that tension, between embracing and rejecting labels. I have even called myself “Post-denominational Orthodox”, which is nonsense logically, but expresses how I feel. 3) What is the role of Orthodoxy and social criticism of the Orthodox in your writings? I write about Jewish and universal topics, aiming at a wide range of readers. But my characters do tend to belong to the modern Orthodox world; for it is there that the most interesting creative tensions and clashes occur, leading to inner drama, angst and growth, the materials that spawn my writing. As to the social criticism – to my mind, the best critics are those who are deeply in love with a system and yet don’t relinquish their critical minds. I reject one-dimensional writing about religious life, preferring to present a range of people whose attitude towards religion diverge and who are more nuanced and individual. I am interested in books that present faith struggles in an intelligent fashion (e.g. The Sparrow by Mary Doria Russell, a convert to Judaism – a book that had a profound effect on my theological outlook). I’m bored by criticism of Orthodoxy from outsiders or from bitter former insiders; Orthodoxy easily lends itself to being a punching bag and target of ridicule if one wishes to, you don’t have to be clever to do that. My hope is that my critical voice might be used as a springboard for positive change from within. And that my love for traditional Judaism comes through in equal measure. 4) Who are your models in general literature or in contemporary Orthodox literature? I learned a lot about the short story form from the materials presented during my MA in Creative Writing at Bar Ilan University – authors such as Babel, Mansfield, Gogol and Joyce. I also admire excellent science fiction writers such as Ursula Le Guin, Orson Scott Card, and the aforementioned Mary Doria Russell. In terms of good Orthodox literature (a small, through growing, category) I find Potok compelling, and I like to read my contemporaries Tova Mirvis and Ruchama King Feuerman, as well as Naomi Regan and other lesser-known Orthodox writers (such as Rabbi Shlomo Wexler who authored The Daughters Victorious, on the Bnot Zelophchad story). In general I believe and hope that Orthodox writing, if we can get past certain moralistic tendencies and a lot of bad writing in the community, will develop to a more sophisticated, imaginative, daring mode. 5) What should we be reading in Orthodox literature right now? Ruchama King Feuerman’s In the Courtyard of the Kabbalist was nominated finalist in the 2014 National Jewish Book Awards (I am doing a joint book event with her– see above for details). There are many new authors, most of whom I have not yet had a chance to read, and this is an exciting time of emergence for this population. In Hebrew, I highly recommend Emunah Elon’s novel Bemuflah Mimeni, a delicate, moving modern version of the Resh Lakish and Rabbi Yohanan story, with a Sliding Doors theme. Additionally, Michael Schonfeld has written Hahok Lemeniyat Habedidut, overlapping with some of my themes around singles and loneliness. My story “Dateline Manhattan 2029” presents a dystopian future in which the gedolim enact a series of rules in the 600-page volume Ozer Dalim to address the so-called “shidduch crisis”, including mandatory parties, dating coaches, singles ghettoes and more. Intriguingly enough, Schonfeld presents a similar idea, whereby in Israel of 2020, the Knesset is considering passing laws penalizing singles. 6) Does your book fall into the chick-lit genre? There is a resemblance, but I wouldn’t use that category per se for my book overall; despite much humour and light-heartedness, it’s ultimately darker and more layered and symbolic writing than this genre allows. I do engage with issues concerning modern womanhood: relationships, emotions, self-image, etc; and my female characters support each other through traumas such as broken relationships, the Intifada and the challenges faced by English-speaking immigrants to Israel. Yet the themes of spiritual search and longing are also present for men, and my stories featuring male protagonists. I’m even rejecting to a large degree the prerequisite chick lit/Hollywood happy ending – the neat conclusions (engagements/ marriages) I included were actually at my publisher’s insistence, and they come in the form of a play, such that my characters are a bit like puppets. Still, we Jews do believe in happy endings (see Kohelet and Iyov) so I am glad they are there to give hope and joy. 7) More than one rabbi has proposed that Orthodox writers should submit their work to them for an halakhic OK. How would you respond? My gut reaction is a no – I prefer self-censorship and would hate for this to become another area where a kashrut symbol is necessary. Having said that, kashrut in its best sense is a service to the consumer to inform about standards and indicate what is inside, like movie ratings. Book ratings by an objective body might not be such a bad thing. I did have one haredi reader who objected to the language employed by some of my characters, remaining unmoved by my argument that manner of speech was true to the characters, or my defense of my integrity as a writer (I offered to refund her money…) Had there been a rating system, my book would likely have gotten a PG, (not a G or U) and then she would have known in advance not to buy it. 8 ) How is the writing of literature for you an expression of your religious life? In a course at Bar-Ilan University with Professor Susan Handelman entitled “Religion and Literature”, I discovered that literature carries a great deal of spirituality, where spirituality implies connection with self, others and God. As an author, you hold your readers in your hands for a significant number of hours, often consecutively – something few rabbis can boast. You get to choose where to take the reader: the illuminative moment, the high drama, the laughter, the tears, the surprise twist. A good writer’s voice enters the reader’s head and lingers there even once the book is closed. So I feel that through my book I can provide relaxation and pleasure – badly needed in today’s hectic world – and oneg Shabbat, in the words of more than one reader. I can also aspire to teach Torah in vivid ways; to exercise the reader’s faculty of empathy for unfortunate others, or make those who are the unfortunate ones feel validated and less alone; and even to awaken the yearning for G-d. Personally when I finish a good book, I sigh and feel that the world is a wonderful place and I am in love with G-d’s creation. Hopefully some of my readers will feel the same. 9) How did you come to write your first book Nehama Leibowitz: Teacher and Bible Scholar (Urim, 2009 – National Jewish Book Award finalist)? In 1998, Tzvi Mauer of Urim Publications envisioned printing Modern Jewish Lives, a series of biographies of great Orthodox personalities whose open and un-stereotypical nature meant that the more right-wing Orthodox printing houses would not touch them with a ten-foot pole. I was privileged to be commissioned, though young and inexperienced, to write the book intended to launch this series (I say ‘intended’ because the project took ten years instead of the projected two – a combination of Nehama Leibowitz’s multi-faceted nature and long life, and my perfectionism – and it ended up third in the series instead of first). The act of documenting someone else’s work, though, is one requiring tremendous amounts of self-effacement, which is a trait I aspire to but in which I do not naturally excel. By the end it was somewhat draining I was very ready to put it behind me and turn to the words, ideas and characters that were bursting to be born from my own mind..
10) What do you admire most and not-admire about Nehama Leibowitz? Despite all of her talents, erudition and fame, Nehama remained a very warm, caring, genuine, unpretentious and modest person who spoke her truth and kept to her moral standards. She innovated without trumpeting it about, and was dedicated to Torah. She was a mensch, nurturing others, but also courageous and true to herself – for example, she married her uncle when she was just 25 and he 54 years of age. She did this against the wishes of everyone around her, including her family. Nehama’s teaching style was quite forceful and rigid in many ways, and I don’t think she was able to truly hear everything her students wished to bring into the class, if it did not fall within her perspective. Indeed, I don’t believe Nehama would have understood the kinds of issues I want to raise, had I been her student. I see myself as a person with 21st century consciousness, while Nehama was a person of her time, of the 20th century, and would have been unwilling or unable to follow me to the places I wished to go. This saddens me, both personally and also in terms of the limitations it places on her work. She also did not change very much throughout her life, teaching the same Torah throughout, while I am a person of change. And lastly, she tended to reject religious experience in favor of doing mitzvot as the fundamental of Jewish living. A rationalist, most likely influenced by her family – father, husband and brother – she did not incorporate Hasidic or kabbalistic teachings, aside from the rare piece of Zohar, in her work. For me, these two corpuses carry traditional Judaism into the postmodern age, and resonate deeply. Hence, their absence is a lacuna, though Nehama’s passion and poetry do a lot to make up for it. I guess, if I am to answer honestly, my greatest fear is that despite my own love of teaching Torah and making it vivid, Nehama would not have understood or approved of me. I would not have met her high standards and my existential questions would have been classified as unnecessary navel-gazing, an act she did very little of. This, along with her shutting the door on biblical criticism, freed up lots of energy for bringing people to love Torah. Questioning and doubt sometimes seem to me like spilling precious energy on the ground, Onan style. Yet I cannot help my existential bent. Ultimately I am different from her and have to be authentic to myself. My second book, and any meaning and pleasure it gives to people, would not have been written by Nehama Leibowitz. We each have our unique path to take in life. 11) Can you say something about Nehama’s poetics? For the most part, Nehama’s approach closely approximated the methodology of the New Critics, an approach to literature spearheaded by T.S. Eliot and others. They read the text closely, and were interested only in what was written and not in its historical background. Nehama’s goal was to counteract the habit of “reading the Bible like a madly galloping war-horse,” to force the reader to slow down, pay attention to nuance, structure, layers, word order, tone and rhythm. For her, one small detail might contain an entire philosophy or a crucial moral point. No repetition was redundant – indeed, a favorite tool of hers was to undertake thorough comparisons of two texts that appear to overlap, checking similarities and differences. The literary context was also all-important for this type of reading. Nehama disliked biblical criticism, believing it to be with riddled with ignorance and anti-Semitism, and only quoted critical scholars on rare occasion. She was extreme in her rejection of realia, namely the archeological, anthropological, geographical, zoological, and botanical aspects of biblical research, and in this differed from – and argued vociferously with – some of her Orthodox colleagues in later years, most prominently Rabbi Yoel Bin Nun. Reportedly though, towards the end of her life she openly wondered if she had been too extreme in her stance. Back in 2004, when I received a call from a known rabbi in Har Nof asking about how the hair in Tirupati, India was offered, I never expected to be actually visiting a decade later the sacred mountain of Tirumala, near Tirupati. The Rabbi was unsuccessfully attempting to avert the expected panic that would ensue when the hair used in the wigs wore by Orthodox women was declared forbidden because of its origin in a Hindu Temple. (For those unfamiliar with this unusual story see here, here, and here) The rabbi’s questions were limited to whether it was similar to rabbinic conceptions of Greco-Roman sacrifice and the Rabbi took the Talmud as a guide to contemporary Indian practice. Visiting the actual mountaintop offers a broader vista on many levels. My observations are in the context of the wig controversy. 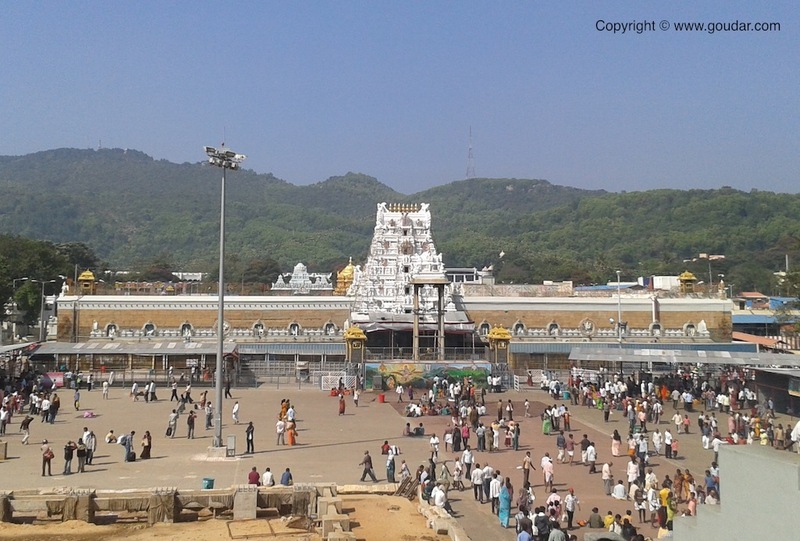 Tirumala is fittingly at the top of a mountain as it translates to literally a sacred hill or high place. About three quarters of a mile up, one finds the the Tirumala Venkateswara Temple and the nearest town in the valley is called Tirupati. It is the most visited pilgrimage place on earth, receiving more visitors a year than the Vatican or Mecca. To put it into numbers, the site receives about 156 million visitors a year averaging out to be about 60, 000 on an ordinary day and hundreds of thousands on a festival. Until recently, it was also the wealthiest religious institution, maintaining an annual budget of $167 million USD. The actual wealth is unknown but generally thought to be much greater than the Vatican’s. During my stay in the city of a thousand temples, Kanchipuram, a town three and a half hours south of Tirumala, I observed a mini-celebration in the town center organized to noisily fete a group of male pilgrims who were beginning their four day walk to Tirumala. While I did not walk with them, I was able to travel by car on well-paved back roads to reach the temple, which was about 138 km (86 mi) from my starting destination. My local journey at a hotel in Tirupati (16 miles away) that offered check-in based on 24 hour units since the overwhelming majority of the guests people were flying in to visit the Temple for a few hours and then fly out. How does one choose the hour in which one makes the holy pilgrimage for those who can pay the extra fees for immediate entry? The hotel had a full time horoscope prognostigtian and, on the telephone, a direct call button right next to the room service and concierge buttons. The roll of horoscopes in Indian culture is not given much attention in the West but it is ever-present and further makes me think that I am walking into Abraham ibn Ezra’s astrological world. The ride up Tirumala Hill is straight up, 980 above sea level. The temple itself is located on a big plateau, about 10.33 square miles (27 km2) total in area. It comprises seven peaks and has a permanent population of 18 000. The road up has overlook points and breakdown areas and emergency crews ready on hand. Also on the mountaintop is a ring of semi-decent looking hotels, more clinics, and more activities for kids. This outer-ring area also has a wonderful museum with an amazing collection, nicely curated showing artifacts from the history of the Temple mount, ancient religious objects, and Temple life. Imagine if Jerusalem had never been conquered and never lost anything to war and could therefore display 2500 years of artifacts. The long display case containing a millennium of musical instruments in another museum could have been an entire exhibition room. On the other side of the circle is an Indian bazaar with wide avenues about five blocks by two blocks selling religious pictures and statues to take home, souvenir devotional objects, and pietistic chapbooks. They also sold children’s toys, especially big stuffed animals; there seems to be a custom to buy one for your children so that they enjoy the trip. There are also food concessions ranging from restaurants to pushcarts. There are also pietistic performances, when I was there men were singing bhakti hymns in Telugu on a small bandstand. The college students making pilgrimage discovered the tackiest item being sold was a winter scarf that when wrapped around one’s head made one look like the halo bands on the Temple statue. Running down the center of the bazaar avenue is a sitting area covered by a high corrugated metal roof for sun and rain protection where people took naps or ate meals. The next area on the mountain top was the holier Temple region, flanked on either end by the gopuram (the large tower that marks a south Indian Temple area) inside was a large campus sized fenced center that has that includes all the ancillary buildings to the Temple. This area is surrounded by the graded metal holding pens to be used on days of extreme visitation. Also included in this area is a large bakery of sweets with long lines dominated the first section. Each person who visits the Temple gets a token for two sweet laddu as prasadam which has divine blessing from the deity and they can buy more at the bakery. Then, there was a large block long holy water tank as found in most South Indian temples, partly a symbolic beauty of the pool, part a place to bath before visiting the Temple, and in this case a roped off area as a kiddie pool. Hindu purity law is similar to Karaite Jewish law and a pool of water is sufficient for purity. It bordered onto a large open square with a stage for artistic performances at one end with a copy of the sacred statue inside the Temple. For Hindus, this has become the abode of God, the place where one can directly see the divine, the closest most will ever get to a religious epiphany of the true Supreme Being. Originally, the Temple was a Tamil holy site to Venkateswara, identified by the important 11th century religious theologian Ramanuja as another incarnation of Vishnu, now treated both as a separate deity for adoption as one’s personal representation for personal worship (Ishtava) and as the place to see an epiphany of the Divine behind all specific deities. Ramanuja taught that there is only one Supreme Being and the plurality of manifestations is only images. For Ramanuja, images are not just a human concession or a means or see the divine through a glass darkly but the very thing that allows one to come to the divine. 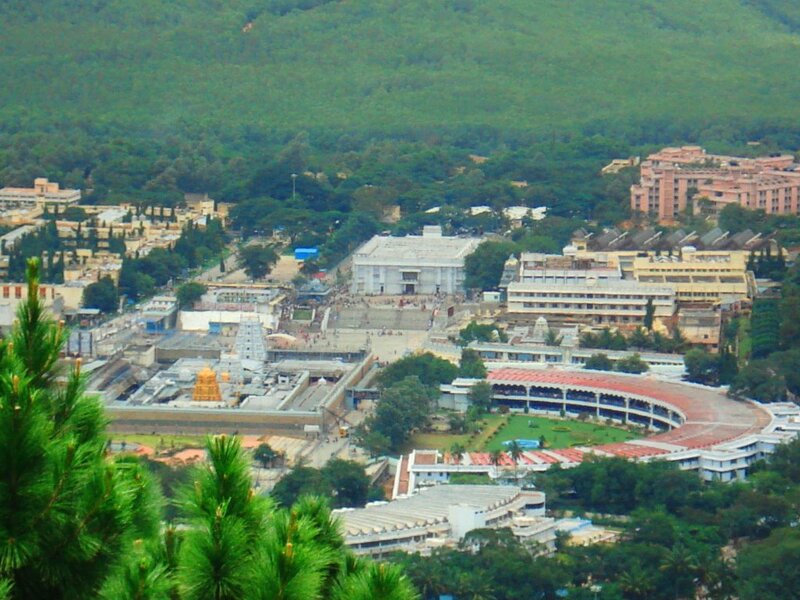 The Bhagavad Gita (XI) describes a scene where Arjuna asks to see God glory (as in Exodus), here at Tirumala it is theoretically everyone’s chance. However, when crowded, the devotee may only get a three to four second vision. The time in the Temple is exclusively for the vision of the statue. If one wants to offer personal prayers and make personal offerings, there is a place in the center courtyard to offer the traditional camphor flame, incense, flowers, and to make sacrifices of coconuts. See the photo below and notice that the tonsuring building is the white building about two blocks in the background. The tonsuring building is a white brick building like a 1960s government or school building modified to be open for tonsuring and bathing. One enters it from the bazaar area and it is on the border between the bazaar and the Temple area as a preparation for going further into the temple compound. This building also has the queuing metal grating in which people sat and hawked soap, toothbrushes, shampoo or even little kits- like a mikveh kit. Inside the building, Men are milling about soaping their hair before the tonsure, mothers are hovering over the haircuts of their sons, and people are waiting for friends. On the left hand side of my view was another corridor with men semi-dressed washing, showering, and bathing in preparation for the Temple visit. Those who have had tonsuring have the treat of bathing in hot water, a luxury in India. Men came into the building wearing their everyday clothes, started to disrobe to soap up their hair, had their hair shorn, and then went next door to wash, groom, and bath. They emerged wearing purified and wearing white dhotis; the virtuous gave their clothes away to the mendicants. Unfortunately, the layout of the building and the transformation of the men into shaved uniform wearing devotees made my Jewish eyes occasionally flash images of head shearing and showering upon entry to a concentration camp. The next step for the men in this case was to walk to the locker building to deposit their shoes and belongings in order to enter the long Temple queue barefoot and pure. As to the question of the relationship of sacrifice and tonsure: in a simple answer, they are not related. There are none of the signs of Hindu worship:, either camphor, incense, bell, or fruit. There are no statues or images of the divine. No Hindu ever worships wearing shoes, even shower shoes. For all religious homes, one takes off shoes before entering because they have a shrine in the home, this also applies to university rooms or businesses that have shrines. One would not make invocations or chants with shoes on. (See shoes in picture below. )These points are not dependent and language, translation, or regional difference. Pre-schoolers are already trained how to make offerings or worship. No local, regardless of education level, would confuse worship and tonsuring. What is the meaning of tonsuring? Tonsuring show one’s love for the Gods by washing away one’s past and starting anew. In some cases, someone with a closely shaved head is practicing celibacy. The hair is a symbolic offering of one’s beauty, and in return, one expects blessing. 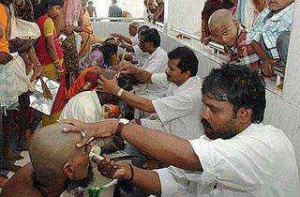 Tonsure can also be used for punishing people for severe crimes as well as a sign of giving up false-ego. According to the rules of the Vedas, the Chudakarana (tonsuring of hair) should be performed either in the first or the third year of the male child as a form of consecration. In Northern India, tonsuring is limited to auspicious occasions. One of the graduate students shaved his head as a morning ritual for his grandmother. It is not uncommon to tonsure the head of a child after the death of a parent. The corpse, too, often receives the tonsure after death. A professor took her daughter to Tirumala for tonsuring as a way of creating an egalitarian equivalent to the boys’ ritual. In the Dharmashastra, Widows are required to tonsure. In Southern India, tonsuring is common as a regular form of votive piety done on a regular basis. Many Southern Indian temples have buildings for regular head shaving. In one city, I found the tonsuring building away from the Temple tucked amidst the concession stands. I bought Diet Coke in the next concession while watching. 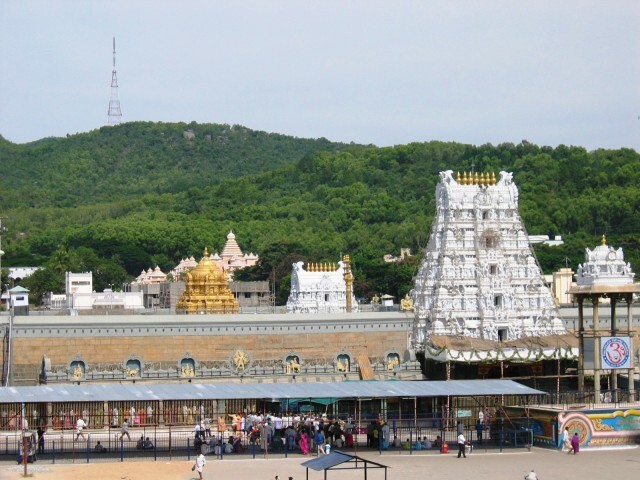 Why tonsure at Tirumala? It is custom to make vows that are fulfilled at Tirupati. Vows are done partly because the religious life is filled with votive donations especially to be healed from illness, for children, or as thanks. And partly one makes vows as a spiritual preparation for entering the Temple sanctuary. Among the contemporary votive offerings includes the most popular walking up the 11km footpath to ascend the mountain especially among those in their late teens and twenties (your luggage meets you at the top). Angapradakshinam is when pilgrims lie prostrate, and then roll around the temple, chanting the Lord’s name. Tulabharam is offering one’s weight in coins or other items such as gold, bananas, or sugar candy. Tulabharam is generally performed for children. Tonsuring is in the Kalyana Katta building described above but for the wealthier there are barbers set up in the hilltop hotels and guest cottages at the start of the hilltop so that they can bath and get dressed in their hotel rooms. Niluvudopidi is offering to the Lord the ornaments, etc., that one is wearing when one takes the vow. The biggest source of income for the Temple is from those who directly donate gold, jewels, or money; giving is meritorious. The museum exhibited older forms of vows such as committing to wearing shoes that are a bed of nails while ascending the mountain. For those who want more information, there are many firsthand accounts in books and online here and here and instructions for pilgrimage. In a pair of scholarly articles by Benjamin Fleming and Annette Yoshiko Reed, the question they pose is: what happens when Hinduism is confronted by someone who never heard about Hindu categories? According to this article, the rabbis paid “great attention to the details of the Hindu practices, but they interpreted them in conjunction with laws about Greco-Roman religion in the Mishnah and Talmud.” They did not understand that tonsuring is not the same as darshan (vision of a deity) or an offering to a god, and that the cutting of hair can be likened to the washing of dirt from the body. They also did not understand that barbering is not a temple ritual since it is done by low caste barbers—not Brahmins. The rabbis did not ask questions about the entire pilgrimage process to the Tirupati Temple complex or what is done as part of the pilgrimage. In fact, one rabbi imagined he saw the hair actually brought as an offering and thought he was the only one acute to notice that the priest was sneaking the hair out to sell. Another rabbi thought that the stainless steel collection drum was a deity that was being feed. In both articles, there was the prior assumption that this practice is idolatry; the only question is whether there was an offering. “The pilgrims were asked: If your intention is to give a present why do you cut it here and therefore have to wait for hours in a queue? Why don’t you cut it at home and send it to the God?” They received answers that it is more virtuous not to cut it at home therefore “we want to cut it here because here we are in a holy place[ . . .] and the idol loves our hair.” So they concluded it was forbidden. Eventually, this first thought was overruled with more information.” Leniencies to wear the hair were found by a variety of rabbis; some of their reasoning was based on the barber’s lack of intention for worship, on the tonsuring as a non-ritual act as defined in Greco-Roman terms and on the lack of probability that one has the Temple hair in one’s wig. As noted above, there is no offering or placing near the murti (statue) that was two blocks away and surrounded by fences and security. And, as Fleming and Reed note, it is worth studying why the rabbis worldview assumed that eye-witnesses, academics, and Brahmins were not telling them the truth. And that even if they the experts were telling the truth, they assumed that the average, unsophisticated worshipper confused bathhouse and Temple, as if an unlettered Jew in the shtetl would not be able to tell mikveh from synagogue or yizkor candle from menorah. The rabbis assumed that the average person could not tell the difference between a votive and sacrifice as if these practices were some ad-hoc rituals whose performance was not deeply embedded in the ritual practice of daily life or that the pilgrimage process would be confusing to its practitioners. In addition, they did not realize utilizing a Hindi speaking translator to communicate to Tamil and Telugu speakers and to translate from there into broken English would not be able to translate terms properly. Dr. A.V. Ramana Dikshitulu is the head Priest at the Balaji temple in Tirupati . He holds a doctorate in molecular biology and is an inimitable authority on the Agamas”, the crucially important Vedic scriptures. Can you please describe the “Vaikhanasa Agama” and explain why it is important? All of the Agamas elucidate the science of ritual but the “Vaikhanasa Agama” is unique in that it gives more detail concerning the performance of ritual, both in the temple and in the home . The “Vaikhanasa Agama,” written by Sage Vikhanasa, is one of four main “Vaishnava Agamas.” The “Vaikhasana Agama” exists in two parts: the first part deals with rituals that are done in the temple and to the Deity whereas the second part deals with purification ceremonies that a priest must undergo in order to qualify to serve in the temple. 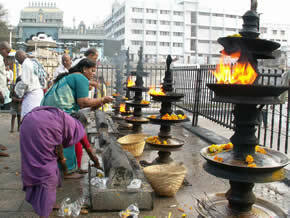 The temple rituals are designed to keep the laymen’s physical senses satisfied. This is done by making the process personal. It describes how the Deity is treated as we would like to be treated ourselves. He is put to sleep at night and awakened in the morning. He is given a bath and dressed in fine silks, jeweled ornaments and fragrant flowers . He is fed a variety of fine foods. Finally, he is carried in grand procession around the temple. As we all know, the dearest thing to man is man. We know God will be happy if we do for Him what we would do for ourselves. Although the “Vaikhanasa Agama” is available to be read by anyone who knows Sanskrit, it is not easily understood, even by Sanskrit scholars, because of its coded language. The verses have double meanings; the valuable inner meanings can only be perceived by those who meditate deeply upon the verses . Even then, only those at a certain level of spiritual evolution can grasp the deepest meaning. We conduct workshops to stimulate this understanding in our Priests. Are the principles of the “Vaikhanasa Agama ” to be implemented only by Priests? This Agama is for people who have no other purpose on Earth but to worship Lord Vishnu. Yes, it is for Priests– Priests who will take up no other vocation. Take me, for example. I am a doctor in molecular biology. Yet, I am a Priest. My elder son is an expert in computers and has a college degree in finance and marketing. My second son is an electrical engineer, and my third son is a bio-chemist. Yet they are also Priests. Like me, they serve here in the Balaji temple in Tirumala. From your perspective as a priest, how may devotees receive their greatest benefit from a pilgrimage to Tirumala? If we pray to such a powerful Lord as Balaji for minor things like a promotion, a transfer, a seat in medical college or a marriage proposal, it is possible that these wishes will be granted. But making such requests is like asking for a spoonful of water from an ocean. There is something so much greater to be had here: spiritual evolution. Through the ages, man has evolved both technically and spiritually. However, further spiritual evolution must now take place, for man is still spiritually primitive. It is natural during this Kali Yuga (age of darkness) that we be more attracted to worldly pleasures and ignore spiritual pursuits. To have even a preliminary understanding of the spiritual path during these difficult times depends largely upon one’s personal ” karmas .” These are “karmas” brought over from previous births. Read the rest of the interview here.